When Moses was chosen by God, he was uniquely endowed. Moses would reveal the very words of God such that he would be as God to his brother Aaron who, in turn, would speak to the nation of Israel (Exodus 4:10-17). Moses was God’s chosen administrator to the nation of Israel. God communicated publicly with Moses to establish him as His authorized representative (Exodus 19:9). God communicated regularly with Moses at the tabernacle (Exodus 29:42; 33:9). 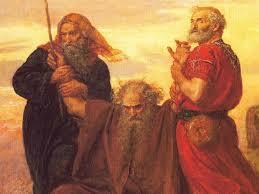 God communicated through Moses to teach the nation of Israel His Word (Exodus 24:2-4; 34:27-28; Deut 31:9, 24-26). Thus when God spoke through Moses, his words would be the inerrant words of God.